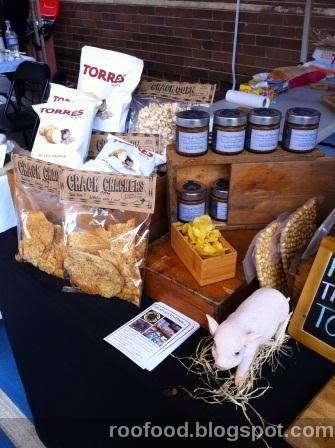 Saturday found me at Ramsgate Organics Foodies Market held in the grounds of Ramsgate Public School. I had a lovely time wandering this market, filled with lots of small producers selling honey, truffles, french sausage, bread, homebaked goods, take home meals, burek, nougat, meat, seafood, flowers and nuts along with food ready to eat on the spot. The market is also smattered with clothes stalls and boutique designers. Everyone is friendly and took the time out to have a chat with me. The vibe of the market is morning fresh, family friendly and has a huge community feel to it. I noticed families out, people walking their dogs, groups of couples and friends grabbing a coffee and a roll for breakfast and locals doing their weekly shop. Many products are imported from Europe. There are vinegars, oils, crackers and truffle crisps (from Spain) that I have a nibble on. Wow! 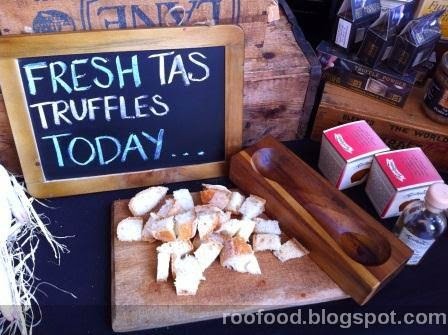 However it's the fresh truffles from Tasmania that are on offer today that spark my interest. I have a peak in the esky where they are nestled together and the aroma that wafts from the esky is heady and entoxicating. At only $2.50 an ounce it's a bargain and I am tempted. 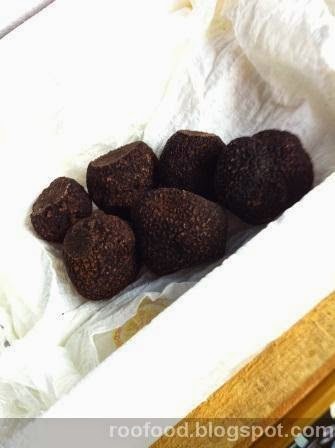 There is perhaps only 2 weeks left of this year's truffle harvest. I couldn't help myself purchasing a slab of cheese and feta burek to take home and I stopped by the My French Food stall who make wonderful french sausage. 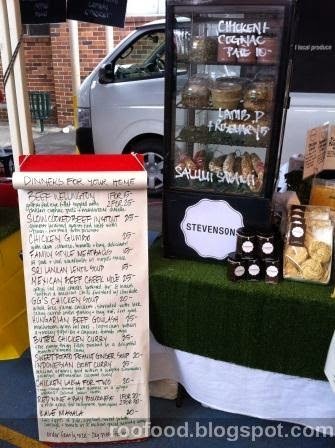 I was in awe of the giant sausage rolls in the oven at Stevensons. 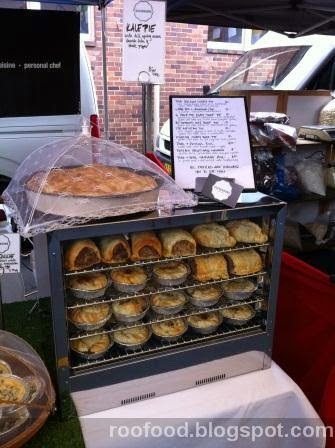 I had a chat with Meg, who lovingly bakes all the products on offer. You can buy to eat straight up or purchase cold to take home. There are 9-10 pies and rolls to choose from and I take home a 6 hour pot roast beef pie with an onion pumpkin gravy. I had this for lunch yesterday (no photo) and I have to say it's the best pie I have had the pleasure to eat in a very long time. The tender grass fed beef and the richness of the gravy is so tasty! I know I'll be back here for some pastries....and I understand that Meg's pates are amazing too. 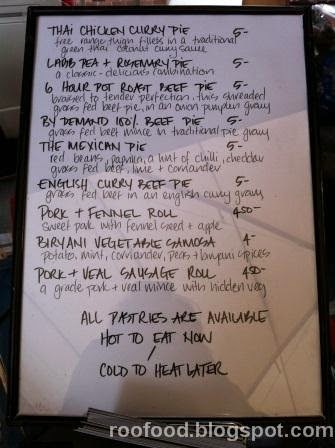 Meg also prepares dinners to take home and the menu looks delicious. 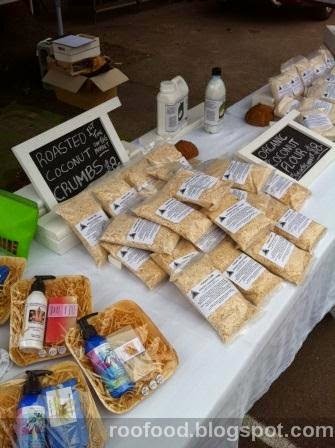 Over at Tamanu Oil, Nathan informs me that today's new product is roasted coconut crumbs. He is very excited to be one of the first to sell this new product from Vanuatu. They smell heavenly. The crumbs can be used in baking or crumbing. 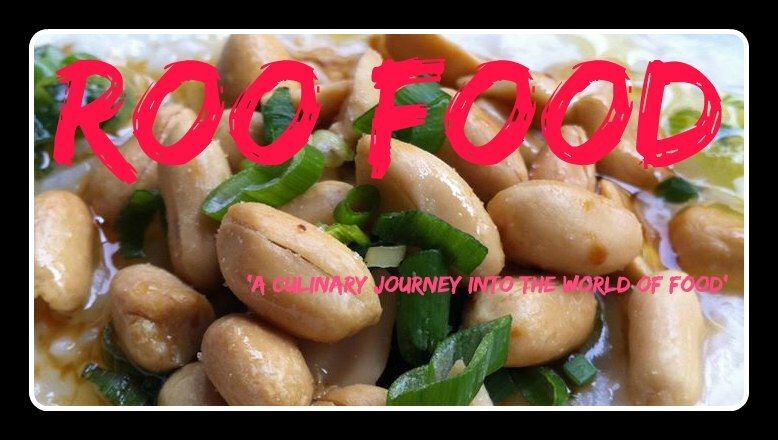 There is something very tropically comforting with toasty coconut. 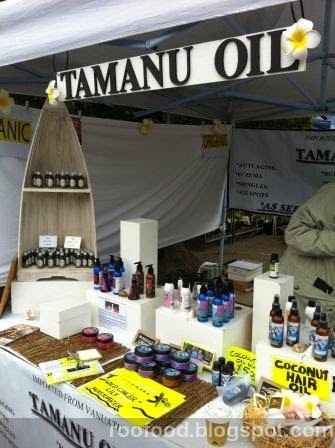 Tamanu Oil is from Vanautu, which is produced from the Tamanu Nut. It is sustainable product. Harvested after the fruit naturally falls to the ground. The nuts are then collected and processed. There is no impact on the tree. Dr Oz is an advocate of Tamanu Oil and Volcanic Earth is one of the brands sold in Australia. Being a pho girl I couldn't resist trying out Eat Fuh. 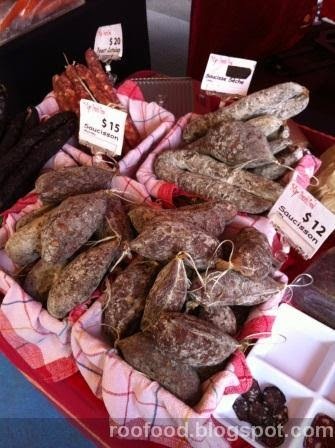 They have a huge following at local markets (they are also at Marrickville Markets on a Sunday). The layers of flavours are warm and comforting on a cold winter morning like today. 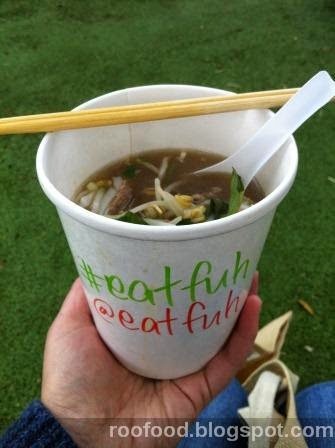 Tender slices of rare beef, crunchy bean sprouts, flat rice noodles and herbage floating in a wonderful rich broth. I like to call this a hug in a bowl. Lastly, I stopped by to taste the Hangover Roll by Christina Battista. I will admit I have been a fan of Christina since she appeared on Masterchef 2013. I love her cooking style and love 50's fashion (although don't wear it as often as I would like - I always feel that I don't really 'fit' the fashion). Anyway, it was a lovely opportunity to introduce myself and have a nice chat while she freshly prepared my roll. 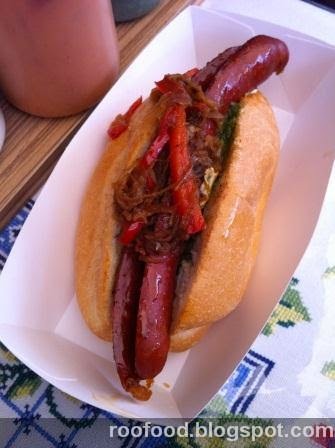 Barbequced chorizo and a gooey runny fried egg on a crusty roll with onions and capsicum and I add a good squirt of chimichurri sauce. It's good and hits the spot (see you don't need to be hungover to enjoy this). 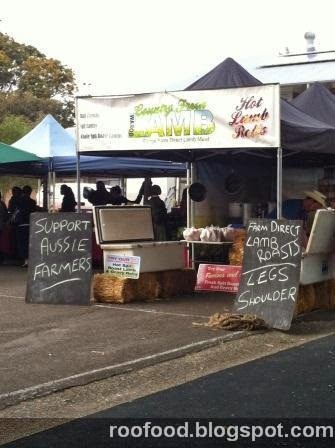 * I have linked to the stall where I can for contact, if not I have linked to the markets for further information. It's such a lovely market isn't it? The sense of community is the best part about it.